Santa Barbara Island, part of Channel Islands National Marine Sanctuary, is home to a large population of California sea lions (Zalophus californianus). Since Santa Barbara Island lies only 38 miles off the coast of Southern California, it is possible to visit the island by boat and dive there. 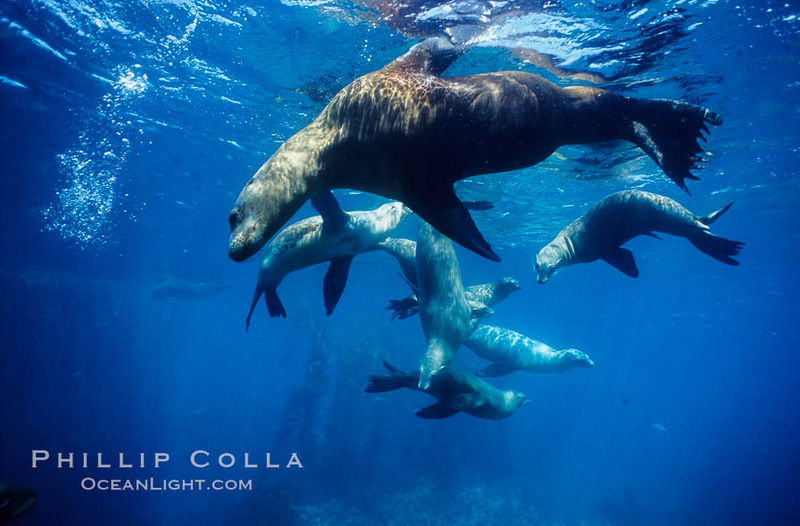 Diving with sea lions is lots of fun, and the best opportunities I have had to dive with sea lions in the United States have been at Santa Barbara Island. 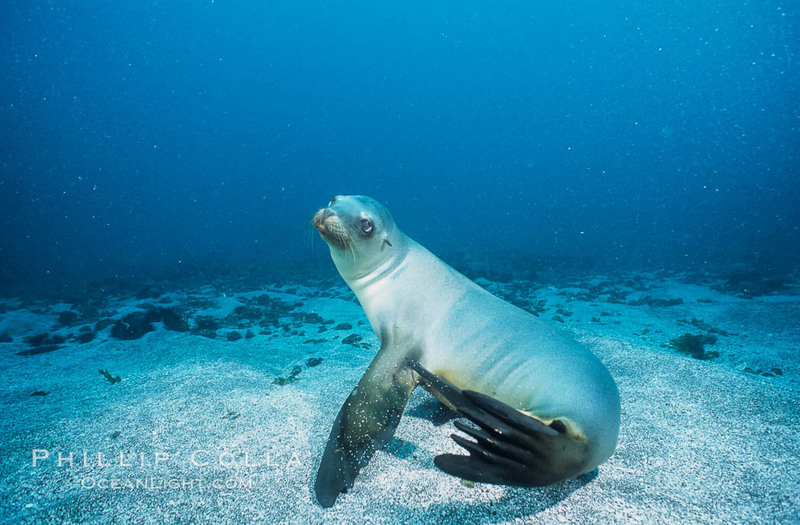 If you like these you can see more of my stock photos of California sea lions. California sea lions, socializing/resting, Webster Point rookery, Santa Barbara Island, Channel Islands National Marine Sanctuary. The smallest of the California Channel Islands, Santa Barbara Island is only one square mile in size. Formed by underwater volcanic activity, Santa Barbara Island is roughly triangular in outline and emerges from the ocean as a twin-peaked mesa with steep cliffs. In 1602, explorer Sebastian Vizcaino named Santa Barbara Island in honor of the saint whose day is December 4th, the day he arrived. Today, visitors can camp and hike on the island under the management of the National Park Service, and boaters visit the island for fishing, kayaking and scuba diving. The rocky shores of Santa Barbara Island provide resting and breeding areas for California sea lions, harbor seals and northern elephant seals. 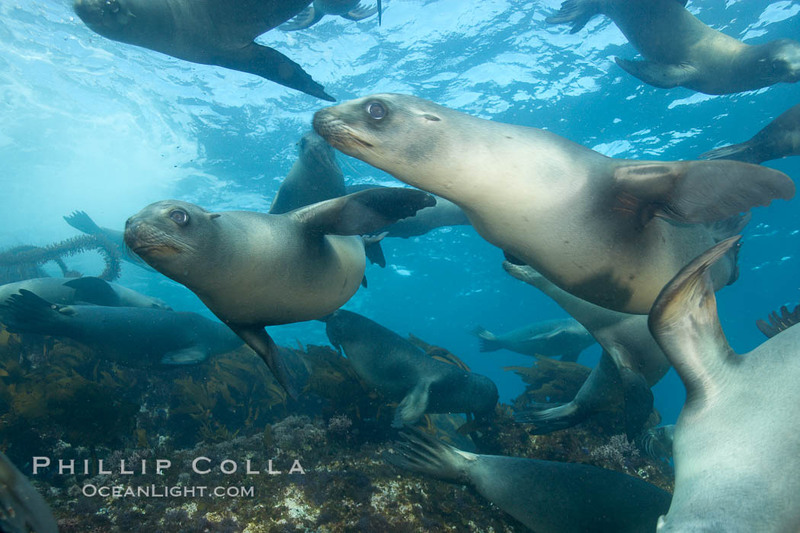 These marine mammals feed in the rich kelp forests surrounding the island. The raucous barking of the sea lions can be heard from most areas of the island. On land these animals appear ungainly, but underwater they are agile and quick. Nothing is better than being mobbed by a dozen or more young sea lions, curiously nibbling on dive equipment and leaving contrails of bubbles in their wake as they speed by. California sea lion, underwater at Santa Barbara Island. Santa Barbara Island, 38 miles off the coast of southern California, is part of the Channel Islands National Marine Sanctuary and Channel Islands National Park. It is home to a large population of sea lions. California sea lion, Webster Point rookery. 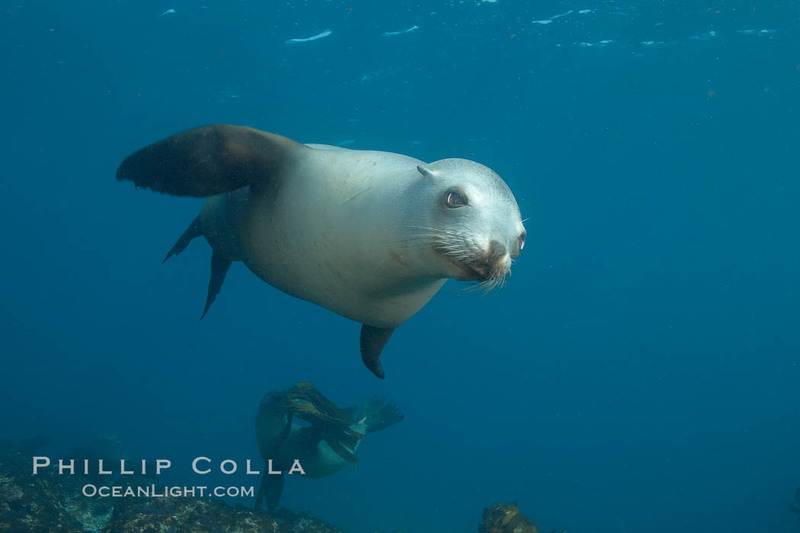 Keywords: Santa Barbara Island, California sea lion, Zalophus californianus.